12 List of Poster Presentations By SessionBallroom A Climate Variability and Climate Change Factors Brown, Mark University of Florida Poster No. 103 Assessing the values of water and its allocation under climate change scenarios using a biophysical approach Clarke, Alice Everglades National Park Poster No. 105 Climate Change and South Florida's National Park Dix, Nicole University of Florida Poster No. 106 Water Quality Changes within the Guana Tolomato Matanzas National Estuarine Research Reserve, FL Associated with Four Tropical Storms Keener, Victoria University of Florida Poster No. 108 ENSO based low-frequency precipitation and nutrient load oscillations in the Little River Watershe Kiker, Gregory University of Florida Poster No. 112 Development of a management-focused, spatial decision support tool to simulate water resource eects of climate forecasting within southern Florida beef cattle agroecosystems Woli, Prem University of Florida Poster No. 111 Water Decit Index (WDI) For Quantifying Crop Water Stressems 1 Sheng, Peter University of Florida Poster No. 110 Eects of hurricanes on estuarine and coastal ecosystems Public Perceptions, Values, Attitudes and Socioeconomic Factors Alvarez Strauser, Diane Beautyberry Books Poster No. 203 Green-up Our Attitudes, Not Our Yards Baum Haley, Melissa University of Florida Poster No. 208 Residential irrigation water application inuenced by socioeconomic parameters Finnegan, Eleanor University of Florida Poster No. 204 e Role of the Islamic Tradition in Water Issues: Focus on America and Beyond Pawlitz, Rachel University of Florida Poster No. 210 Praying for Rain: Media Framing of Water Allocation in the Apalachicola-Flint-Chattahochee Basin Snyder, Samuel University of Florida Poster No.212 Dammed Debate: e Role Values and Perceptions of Water in the Rodman Dam/Ocklawaha River Debate Sobczak, Robert Big Cypress National Preserve Poster No. 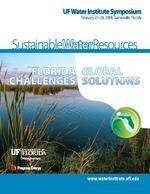 206 South Florida's Watershed Journal Wilson, James University of Florida Poster No. 211 River of God(s): Religious Perspectives and Conservation of Pakistans Sindh River Population Growth and Land Use Change Arias, Mauricio University of Florida Poster No. 309 Characterization of Suspended-Sediment Concentration during runo-events into a closed-basin stormwater system Bhadha, Jehangir University of Florida Poster No. 306 An Attempt to Sustain the Choctawhatchee Coastal Dune Lakes of Florida from Natural and Anthropogenic Perils: A Collaborative Approach Carey, Richard University of Florida Poster No. 310 Nutrient Loads in the Biscayne Bay Watershed, South Florida (1994-2006): A Trend Analysis Kim, Haryun University of Florida Poster No. 305 e inorganic nitrogen transformations in tributaries impacted by fertilizer and ranch activity, the Santa Fe River Olmsted, Tom University of Florida Poster No. 312 Understanding Urban Outdoor Water Use Phillips, Brian North Carolina State University Poster No. 302 Methods to Predict the Lateral Eect of a Drainage Ditch on Adjacent Wetland Hydrology Stocks, Gabriela University of Florida Poster No. 304 Revering Rivers: Perceptions vs. Reality in an Amazonian Watershed Poster Session 1 5:30 p.m. 6:30 p.m.